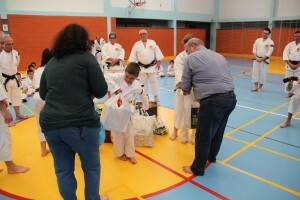 Once again, Shokema branch contributed to helping the martial arts gala ‘Amako’, a non profit gala for a good cause, that took part on the 25th of April. This year the money collected was given to ‘Los ángeles malagueños de la noche’, an association that feeds poor people in Malaga city. 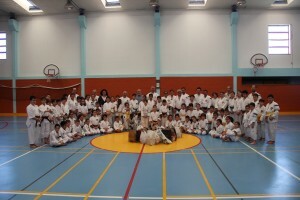 The participants of Shokema, that were led by Toni sensei, made an amazing and tecnical exhibition that included all the main aspects of our discipline. The exhibition took place in Carranque sport center in Malaga, where Shokema has lessons on Monday and Wednesday from 21.00 to 22.30. 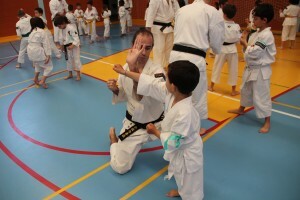 Shokema association also practice every week on Tuesday and Thursday from 20.00 to 22.00, this workshop is realized in the bulding of the local goverment council in the disctrict of ‘Bailen-Miraflores’. 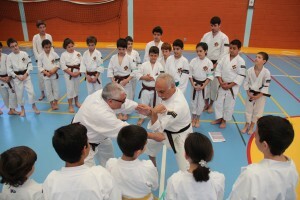 Last April 12 the Shorinji Kempo Fifth National Children’s Gasshuku was held, spurred by the Portuguese Shorinji Kempo Federation, through its Technical Department, and with direct support from Oriental Branch in facilitating for the second time to this activity the access to excellent conditions of Basic School of Olaias. 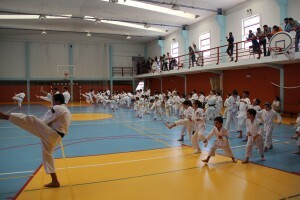 As has been tradition, this children seminar is exclusively and intentionally directed to the young Kenshi up to 12 years of age, while ensuring optimal conditions for Shorinji Kempo teaching, practice, and learning according to the specific characteristics of this population. 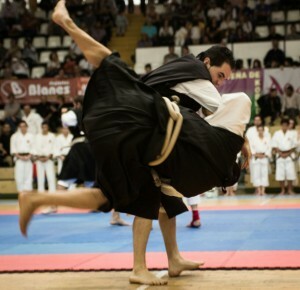 Moreover, we privilege the contact between young Kenshi through the Shorinji Kempo, materializing one of the main features – Kumite Shutai (Paired practice is primary), and the principles of friendship, respect, mutual support, and cooperation. In addition, we aim that young Kenshi know about other Masters, Assistants, and Instructors and other Branch to understand the national reality in order to motivate them through the diversity of contacts and experiences. 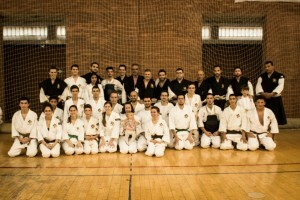 80 Kenshi and 13 teaching staff between Masters, Assistants, and Instructors, all from current affiliates of the Federation gathered at this seminar, in its fifth consecutive year. 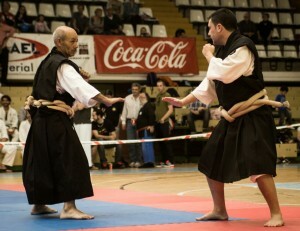 Throughout the day many games were held, and many techniques and Tan En were learned and practiced. But most of all, we overcame the challenge put in the early stage – make new friends! All participants, later in the day, had developed new friendships and created new bonds that will continue to be deepened along the practice with other activities. 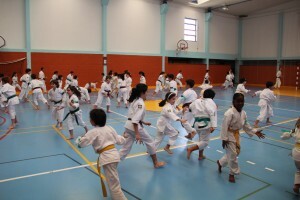 The constant laughter and concentration of these young people and the energy of its strong Kiai foresee a beautiful future for the Shorinji Kempo in Portugal, and all of us will work so that these young people continue to like Shorinji Kempo and being best people through this singular martial art. One can not fail to point out a peculiarity of this seminar which was a novelty introduced by the Federation in relation to the Kenshi registration. Each participant had to ensure that part of her/his registration was held in foodstuffs to be distributed on the day to an institution selected by the Federation. The selected institution was Por1Fio – “by a thread” – (https://www.facebook.com/pages/Por1Fio-Associa%C3%A7%C3%A3o-Solid%C3%A1ria/374437659365747) that is dedicated to collecting goods from various categories to distribute for families and people who are literally “by a thread” in their lives with the difficulties that are going on. This institution, during that day, received between 140kg to 150kg of food (which we now know to have been spread over 8 needy families). 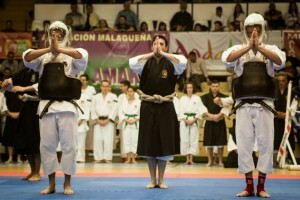 With this gesture, the young Kenshi were able to see firsthand that a modest help makes a big difference when all come together, and that Shorinji Kempo is truly a form of social expression in the materialization of one of the most important maxims of Kaiso So Doshin “half for one’s own happiness and half for the happiness of others.” Later in the day the feeling could not be more rewarding and that of mission accomplished, and the votes that we turn to find the sixth seminar in 2016, where we expect even more Kenshi! 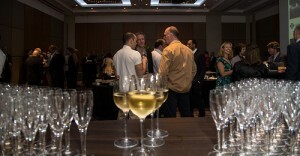 With the generous support of the Japanese Embassy, an event commemorating the 40th anniversary of the UK Shorinji Kempo Federation was recently held over two beautiful days in London (August 2nd and 3rd, 2014). 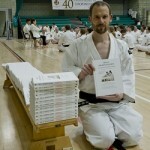 The UK Shorinji Kempo Federation, whose first branch was established by Toshiaki Yoshida in 1974, turned forty this year. 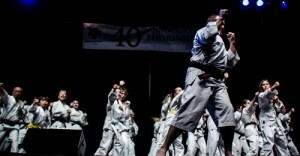 As part of the celebrations, a 2-hour demonstration has held at the Shaw Theatre (100-110 Euston Rd, London NW1 2AJ). 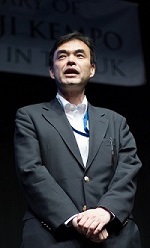 At the demonstration, the federation was honoured by the presence of Hideki Asari, Envoy from the Embassy of Japan in the UK and many other guests. 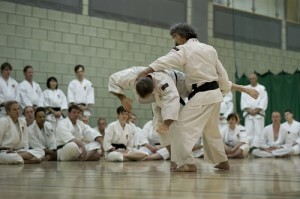 Thirty members hailing from Europe and Japan joined their UK counterparts in executing the demonstration. 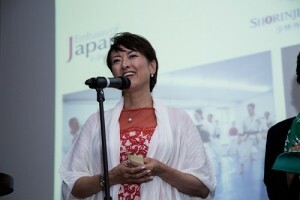 Spectators,who were welcomed to the event with a pamphlet and handfolded origami crane, were treated to a powerful embu performance accompanied by a humour-filled commentary provided by the MC. Bonds of friendship were formed as over 100 members and spectators from seven countries took part in the various study sessions and celebratory events which were held in conjunction with the demonstration. 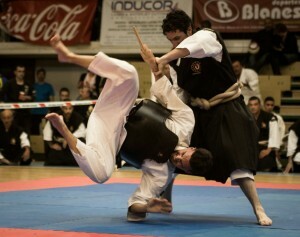 the 9 member organizations that make up the Japanese Budo Association, is currently practiced by over 1.8 million members in 37 countries. 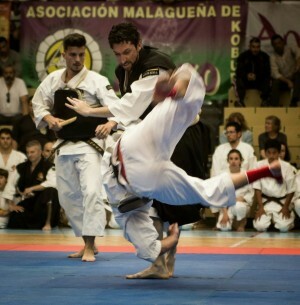 Shorinji Kempo focuses not just on the improvement of technique, but on the nurturing of the individual. above and beyond their day-to-day jobs. 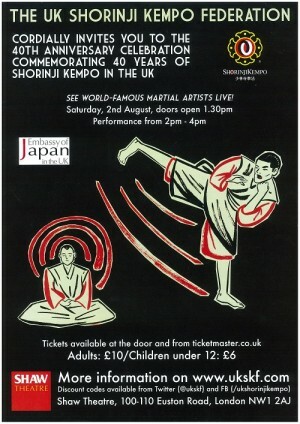 It is the federationfs hope that Shorinji Kempo continues to find success in the UK.